When you are trying to eat healthier, it can be hard to find snacks that pull double duty – providing nutrition and letting you give in a bit to your sweet tooth. The Balance Bar Dark Chocolate Crunch energy bar can do just that! Krista over at Savory Savings recently had the chance to review this chocolately bar and shared her thoughts in a review – check out what she had to say about the nutrients, rainforest alliance and more! I love the taste of these! They are great to have as a snack at night as they have protein as well as carbs to keep you even at night! 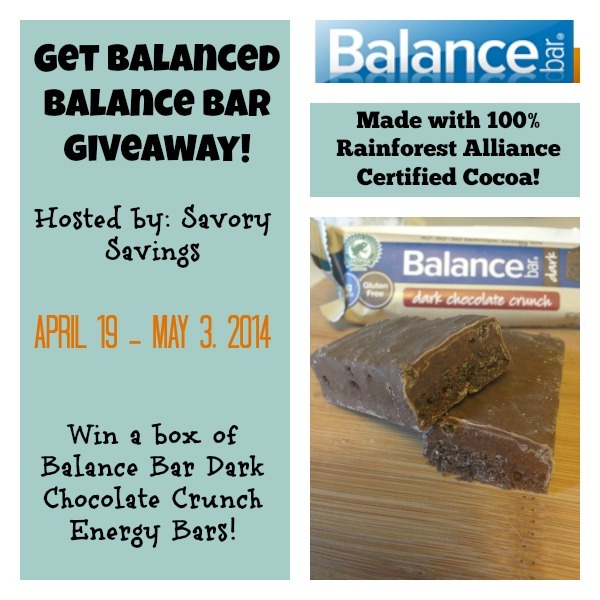 How would you like to win a box of Dark Chocolate Crunch Balance Bar energy bars? If you would like a chance to win, enter with the Giveaway Tool below. If you have won a Balance Bar giveaway anytime from another blog in the last 12 months, you are not eligible to win this giveaway. The giveaway will run from April 19, 2013 through May 3, 2014 at 11 PM CST and is open to US residents, ages 18 and older. Entries will be verified. Winner will be notified via email (consider adding gloriouslygreengal@gmail.com to your safe list) – winner will have 48 hours to respond and claim prize or another winner will be selected.